The South African clothing, textiles, footwear and leather industry is concentrated in the Western Cape and KwaZulu-Natal regions. The KwaZulu-Natal industry is dominated by large apparel manufacturers producing for the mass market. These manufacturers, as well as a number of design houses, outsource to Cut Make and Trim (CMT) hubs in Isithebe, Durban Central and Newcastle. A number of significant textile manufacturers, dyers and finishers are also located in KZN. Members of the KZN Clothing and Textile cluster have experienced employment and sales growth since 2012 – after a major sector decline during the 2000s. Most member firms have made impressive headway in the implementation of lean manufacturing principles. With the help of government and private sector funding, the KZN Clothing and Textile Cluster is collaborating to develop raw material dyeing and finishing capacity as well as the capability of preproduction professionals. 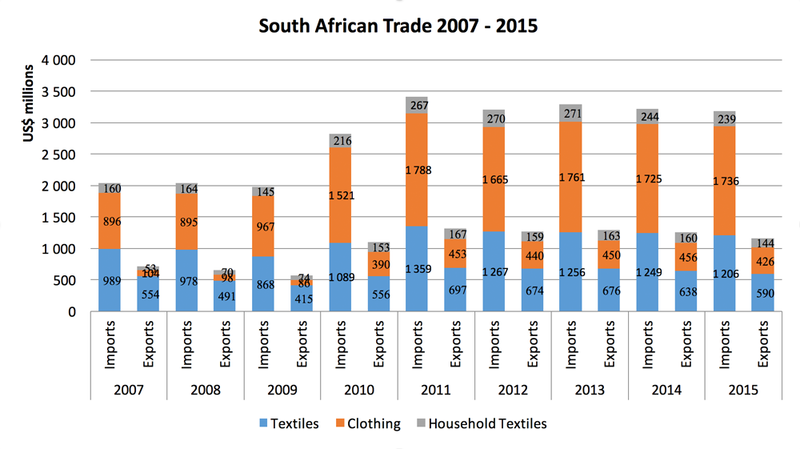 South Africa is a net importer of clothing and finished household textiles. The value of imports is almost twice that of exports. Between 2011 and 2015 there has been a slow but consistent decline in both imports and exports in South Africa. The South African clothing and textile industry has been seeing consistent sales growth since 2012. This follows a marked decline between 2008 and 2011, primarily as a result of the influx of cheap imports. All sectors within clothing and textiles with the exception of knitted, crocheted articles have experienced this growth. 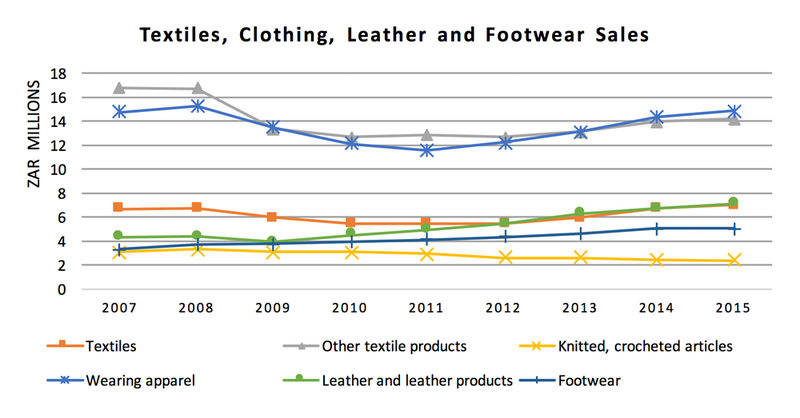 Footwear and leather products have experienced the highest sales growth since 2011.